Longtime crocheter Laurie Wheeler, aka the “Fearless Leader,” is best known for the creation of the CLF (the Crochet Liberation Front) but is also a writer, blogger, designer, editor, and mother of two. 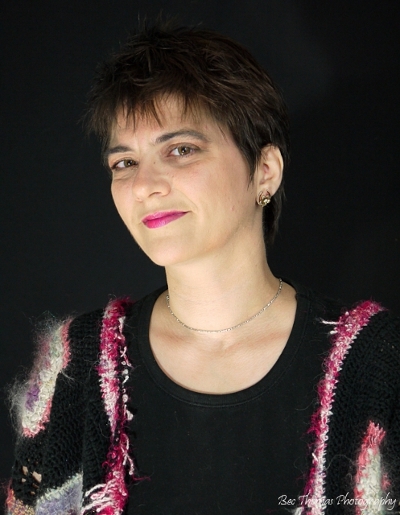 She has even independently published a full-color, collaborative book of stories, patterns, and articles from crocheters in the group because she felt that the publishers in the industry weren’t providing crocheters with what they needed. 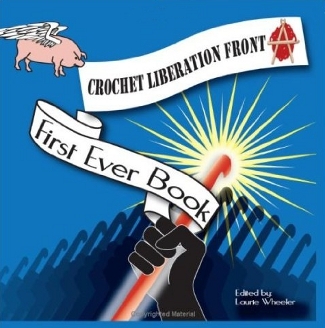 MELISSA: So, how long ago did you form the Crochet Liberation Front? LAURIE: I started the CLF in July 2007, the membership service began in 2012. MELISSA: What did you hope to accomplish when you organized it? LAURIE: In 2007, I didn’t hope for anything, I was being facetious. I was so tired of the crochet bashing on message boards and at shows that one night I was feeling surly and created a joke on Ravelry. I never expected anything to happen and was shocked when people actually joined. It was about six months into it when I thought that maybe we could do something more than just have fun and be silly, that maybe we could accomplish some good things for people who happen to crochet. In 2008 we created the CLF First Ever Book to show the industry what crochet lovers really wanted in the way of patterns and crochet books. In fact, you were a part of that effort! Many well known crocheters now were part of that book and I’m kind of tickled it got a few folks into the design world. In 2009 we started the Flamie Awards (Annual Crochet Awards). I’m not a big awards show person, so I was a little taken back by how popular those became. We didn’t do them this year because I was too busy, but the impact the awards played on the industry has been HUGE. Each year we’ve moved from strength to strength to strength as new ideas get added in and people grow in their businesses, craft and hobby. MELISSA: Have you seen any signs of progress over the last few years? LAURIE: Absolutely. We still have a long way to go, but when I was in Reno this last September for the Fall Knit and Crochet Show (CLF had a booth), crocheters were the majority and loud and proud! That was awesome. Our booth was rocking with awesome designs and yarn, and crocheters showed their support. The industry people were less quick to call crocheters cheap, though they still use the term thrifty, which makes me laugh. If you look up crochet books we have so many more now than five years ago, and more advanced techniques are being published in the magazines and books too! It’s super exciting to see! I think with the ease of self publishing you’ll see even more innovations. Just this fall, four CLF professional members self published books networking with other professional members for editing, contributions, photography and more. As it gets easier to be an Indy I think we’ll have even more crochet awesome. MELISSA: If there was one change you could make to the crochet community or the industry, what would it be? LAURIE: Stop comparing and contrasting crochet with knitting. That drives me nuts. Crochet is not worse nor is it better than any craft. Don’t apologize, don’t ask for inclusion, just do what you love, be proud of it and then network with other crochet lovers to support the craft and the suppliers who support us. As far as the industry goes? I think they need to do some homework on messaging. If all you talk about is strawberries, then that’s what people will buy. If you talk about strawberries 80% of the time and then say “Oh yeah, and we also sell chocolate,” then guess what? Your messaging is not consistent with wanting to sell bucket loads of chocolate. Until you message crochet as much as other crafts, then you will sell less of it. That’s not my opinion, that’s a marketing fact. MELISSA: What’s going on with the CLF right now? LAURIE: Earlier this year I created a membership service to help makers, designers, editors, publishers and suppliers improve their professional development and businesses. I have on-demand classes that range from how to sell your goods successfully at bazaars to walk through on how to create crochet classes and create style sheets. There are a ton of articles about marketing on-line, web design and social media tips, and we have masterminds for folks to brainstorm and network with each other. We’ve seen some great successes come out of this in just 9 months, and that’s awesome! I keep it super affordable, because I know most of our membership doesn’t have a lot of disposable income. It’s a way to invest in yourself and your business. Coming this winter we’re going to do a series of classes on self publishing A-Z, how to start communities to leverage your marketing, and web planning for e-commerce. I love where things are heading. To know that I have really been able to help people make a little extra to support their families is the greatest feeling in the world. MELISSA: Tell me about Hookey! LAURIE: Hookey.org is the social arm of the CLF. It’s a social network that is 100% free to join. CLF Pro members get to have CroPro status and link to their videos, promote their events, products and services. It’s a way to support our professional members and give the crochet community a home that isn’t cluttered with other crafts. We have more than 1000 members, which isn’t bad considering I don’t advertise other than through the CLF News, our Facebook page and on Twitter. I want it to be organic, I want people to be there because they want community, love crochet and want to grow and support each other. MELISSA: Do you have any other projects that you’re working on right now that you’d like to share? LAURIE: Hahaha! You know me so well! Because I keep prices so low at the CLF, I have to increase my income somehow. I don’t want the CLF to be cluttered with ads I don’t believe in, and I don’t want to charge members more than they can reasonably recoup in a year (and then some), so I’ve started to teach other small businesses how to do on-line business, social marketing and I will be offering the self publishing courses to entrepreneurs both on and off line. I enjoy educating people to arm them with valuable skills they can use to improve their lives, if it hadn’t been for the CLF I wouldn’t be doing any of this. I am so grateful for what I’ve learned and how I’ve grown as a person through the experience. Now I get to embark on a career that fills my creative, social and strong beliefs that when everyone does better economically, we all do better. I’m selfish that way, I want the world I live in to be a place full of people not fighting for survival, I want to live in a world where people thrive. When people thrive, I have a better quality of life too, so thanks CLF, you’ve helped me decide who I’m going to be when I grow up! MELISSA: Thank you, Laurie, for taking the time for this interview!